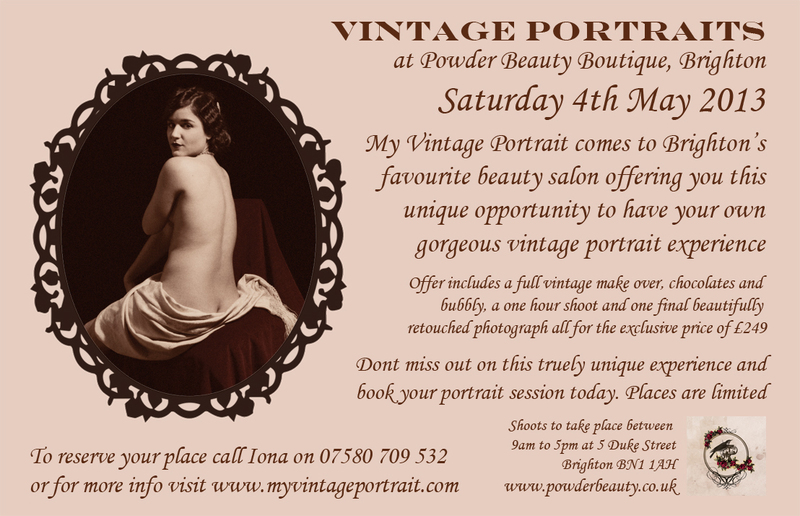 Powder are looking forward to My Vintage Portrait at our beauty boutique on Sunday the 4th May. My Vintage Portrait comes to Brighton’s favourite beauty salon offering you this unique opportunity to have your own gorgeous vintage portrait experience. Offer includes full vintage make over, chocolates and bubbly, a one hour shoot and one final beautifully retouched photograph all for the exclusive price of £240. Don’t miss out on this truely unqiue experience and book your portrait session today. Places are limited! Iona Hodgson My Vintage Portrait. Shoots to take place between 9am – 5pm at Powder Beauty, 5 Duke Street, Brighton. If you can’t make May 4th, then Ilona will also be at Powder on June the 15th. All visit www.powderbeauty.co.uk to view all our treatments and special offers.